"Life must be lived. One has to move on." The Saga of Gosta Berling is notable for a number of things. 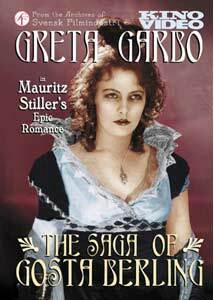 Set in the early 19th century, it is one of the biggest epics of the Swedish cinema, it also is one of the last great Swedish films, and it marks the first leading role of a young Greta Garbo, already visibly being molded into the iconic star. Based on a book by Nobel Prize-winner Selma Lagerlof (who also frequently collaborated with director Mauritz Stiller), it is a sprawling piece that covers numerous stories, intertwining them effortlessly as they all work toward a common climax. The title character (Lars Hanson) is a defrocked young vicar, given to drink and romanticism. The fates of three families revolve around him and his loves over an indeterminate period of time. He first is engaged by Martha Dohna (Ellen Hartman) to act as the tutor to her stepdaughter, Ebba (Mona Martensson), as part of a scheme to deprive the girl of her inheritance. While Ebba falls in love with Gosta, he meets her stuffy half brother Henrik (Torsten Hammarén) and Elisabeth (Garbo), his beautiful young Italian (!) wife, and an attraction begins to form between the tutor and Elisabeth as well. After Ebba learns the truth, Berling winds up at the neighboring estate of Ekeby, where he becomes one of a party of dissolute hangers-on. Ekeby is owned by Major Samzelius (Otto Elg-Lundberg) and his wife Margaretha (Gerda Lundqvist), an uncomfortable relationship to say the least since the estate was left to them by Margaretha's former lover. That fact rankles at the Major, who can barely keep his rage in check both at this fact and at the uncouth assemblage of "knights" on the property. The third family is that of the Sinclaires, who are the aunt and uncle to Elisabeth. Their only child, Marianne, yearns to be an actress but when she is seen kissing Gosta Berling, she is disowned by the family in a fit of rage, leaving her alone in the world. Such hasty rejection is a common theme running through the story. Ebba rejects Gosta, furious at being deceived, though she incorrectly blames him, rather than her mother. The Major casts his wife out and falls into a drunken depression, letting the knights wreak havoc on Ekeby. Equally perturbed, Margarethe returns and burns Ekeby to the ground in a spectacular set piece that in smaller scale anticipates the burning of Atlanta in Gone with the Wind. Marianne is disowned in haste by her family, only to fall into destitution, ravaged by smallpox. Elisabeth's husband learns that she has feelings for Gosta and throws her out as well, not paying any attention to the fact that she has remained faithful despite her attractions. And Elisabeth, in turn, even after being rejected by Henrik, cannot bring herself to be unfaithful with Gosta when the opportunity presents itself. Nearly every one of these hasty rejections ends badly, in death, despair, or destruction. Only when the rejections are rethought and resolved are any of the central families happy. To a certain extent, Gosta himself is a cipher, reflected in the stories of these other families and their complex relationships. His motivations are seldom clear, though he does have a fondness for beauty (a point voiced eloquently by Marianne as she sees him cringing when he first looks on her pox-ravaged face). He seems like a prototypical slacker, who can rouse himself to action on the odd occasion when it's really demanded of him. When that happens, he's capable of significant things. When about to lose his position as vicar, he rouses himself to give the sermon of a lifetime, earning the commendations and plaudits of his congregation, only to reject them angrily in a fit of pique (yet another hasty rejection with unpleasant consequences). Late in the film, challenged by Elisabeth, he finds the inner strength to rebuild Ekeby after its devastation, but still cannot bring himself to force his attentions on Elisabeth. Their relationship seems imperfectly developed; in spots it seems that vital bits are missing, which may be the result of missing footage (the film underwent substantial reconstruction in 1975 using all extant materials, and may or may not be complete), or it may simply assume a familiarity with Lagerlof's book that modern American audiences are unlikely to have. At times the film feels like a faithful rendering of a Russian novel, since it does tend to be focused on the personal lives and torments of a large and intertwined cast. But it's never dull, even when watching both parts in one sitting of over three hours. There are plenty of intrigues to follow and the leads are pleasantly understated for the most part. Only in the last few reels does spectacle take over, and when it does, it does so with a vengeance. Right after the fire, Elisabeth and Gosta find themselves pursued in a sleigh on a frozen lake, pursued by a horde of ravenous wolves. Shot guerrilla style, this sequence has a documentary and realistic effectiveness that probably couldn't be captured with modern techniques. Those interested in Garbo will find that she gets plenty of screen time, and photographer Julius Jaenzen at times lights her in absolutely spectacular manner. She's quite clearly a star here, and everyone is made to know it in no uncertain terms. Shortly after this film was completed, she, Stiller and Hanson would all head to Hollywood, following Victor Sjöström, leaving the Swedish film industry in a ruinous state that it would not recover from for decades. Extras Review: The same Stiller bio and filmography found on the DVDs of his Sir Arne's Treasure and Erotikon are repeated here. The same featurette on Stiller, narrated by Peter Cowie, found on those DVDs, reappears on this disc, with the option to play it together with a 5m:40s segment devoted specifically to Gosta Berling. It's quite solid, as one would expect from Cowie, though he does tend to spend more time talking about Garbo than the movie itself. The last great silent Swedish spectacle, restored to something like its full original splendor, with several extras that will be devoured eagerly by Garbo fans.